I’ve always been an awful plotter. I write intuitively, going down dozens of blind alleys before (sometimes) finding my way out into the sun. I’ll admit, though, that once written, my stories do all follow the generally accepted 3-Act story structure. But I never found looking at the 3-Act structure helpful while I was writing. 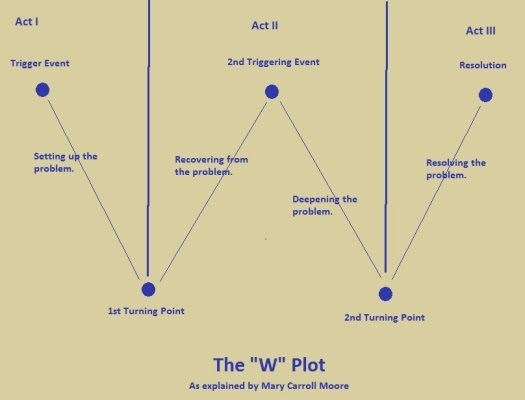 That is, until I came across Mary Caroll Moore’s ‘W-plot’ structure. Mary’s W-plot structure is ingenious because it shows how the action in a story ascends or descends at different times. I interpret this as being the way a character is swept down by events on the descending leg of the W – then moves upwards with new purpose on the ascending stroke. The W-plot structure also nicely illustrates how characters change their minds as a result of things that happen to them, and consequently change the trajectory of the plot. The two major ‘turning points’ are represented by the two bottom points of the W. These turning points occur in the 3-Act plot structure as well. However, it was never clear to me (due to the linear way that the 3-Act structure is usually presented) that the turning points are not so much a turning point in the action of the story but a turning point in the character’s own motivation. In other words, your characters can change their minds. Surprisingly – after five books – this came as a revelation to me. I knew that my characters needed to change and develop over the course of the story, but I had always been so concerned about knowing who my characters were and keeping them ‘in character’ that I had not given them enough freedom to do a complete about-turn and take the plot off in a new direction. 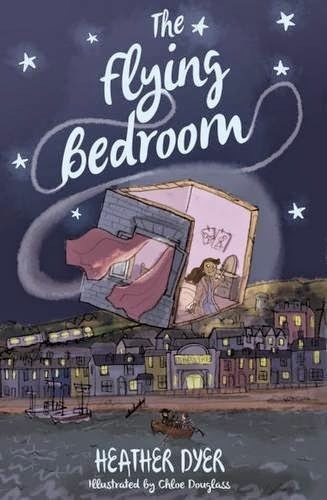 So, although I still write my first drafts intuitively (as, indeed, Mary Caroll Moore still advocates), I keep in mind the W-plot structure and ask myself what it would take to make a character change their mind at a turning point – and how it would affect things if they did. Will take a closer look at this - thanks, Heather! I'm going it investigate these links a bit more later. Yes, "the character changes their mind" is a nice way of explaining that plot needs to be internal as much as external - not just "half way up, the storm hit with ferocity" etc etc. A point to bear in mind on this back to WIP work day. Seems many of us are 're-working' !!! Thanks Heather. I'll definitely look at this more closely - I'm reworking a book at the moment, and it has an annoying habit of losing its way. Thanks, Heather. That's a remarkable diagram - it's true, you can take almost any good plot and it magically conforms to that rough sort of shape.